You will be given a Free reference e-book to read which has 512 pages And the test will be based on that e-book. An IBM system administration certification works in validating the skills and expertise of a specific IBM professional in administering power system servers. It works in proving the ability of a system administrator to lead and mentor other operators who are in charge of administering the operations of an IBM system. It should be noted that in order for you to become a real expert in the field of IBM system administration, you are required to understand how IBM especially the AIX version works in various environments such as enterprise-class and small business data centers and virtualized systems. You also need to improve your skills in device management and networking. To increase your chances of passing the certification exam, you are also required to improve the level of your understanding about the basics of installing IBM, configuring a system and utilizing the virtualization technologies. It is also essential for you to gather information about the usual topics covered in the exam including the configuration and management of AIX networking, storage and device management and executing user administration tasks including developing and utilizing groups and restricting resources. The good thing about this is that you can now easily boost your knowledge about all the mentioned topics with the presence of the free IBM system administration practice course from Brainmeasures which also comes with a free study guide and practice test. Brainmeasures free IBM system administration certification practice course is extremely beneficial for you if gathering more information about IBM system administration is included among your major objectives. What you will love about this free IBM system administration practice course is that it also comes with a free study guide which is comprehensive enough to supply you with the most extensive knowledge of IBM system administration. It helps you in fully understanding the major aspects linked to the field even the most complex issues that are linked to it. The free practice test which is also included in this free practice course is also effective in providing you with a clearer overview about what it usually takes to pass the actual certification examination. This is extremely useful in your attempt to significantly boost your chances of passing the exam and earning an impressive certificate. How to access a system which is incapable of effectively booting? How to effectively handle problems and issues linked to installing media? How to effectively and correctly diagnose problems in your hardware? How to effectively install service updates and optional software? 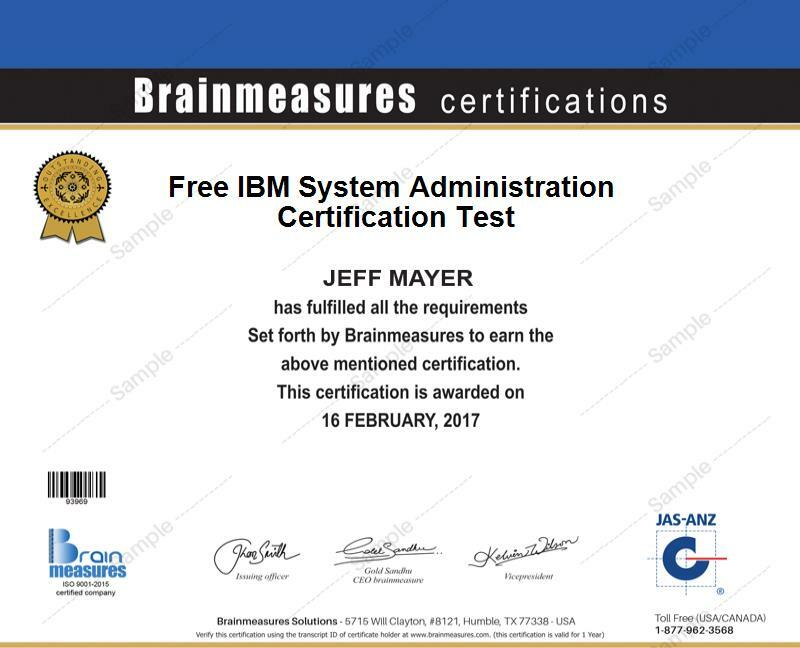 The free IBM system administration certification course which is now accessible at Brainmeasures can be expected to supply numerous benefits to various individuals and professionals. It targets IBM system administrators, analysts, engineers, programmers, developers, architects, designers, consultants and other professionals who are mainly in charge in effectively administering the operations of an IBM system. Your decision to take and pass an IBM system administration certification exam can also guide you in receiving an even higher pay. With the presence of your certificate, you can easily work as an IBM system administration manager and receive a salary of around $68,000 to $96,000 yearly. If you work as an IBM system administrator especially in cities and states that offer a higher pay for this profession, then you can enjoy around $71,000 to $109,000 annually.